Multi-step molecular biology workflows automated by Antha. The automated Antha Type IIS Construct Assembly method combines multiple DNA parts directly from clonal input vectors in a one-pot, room temperature reaction. The DNA parts require no special preparation such as digestion, gel purification or PCR, increasing the efficiency, fidelity and robustness of this method. 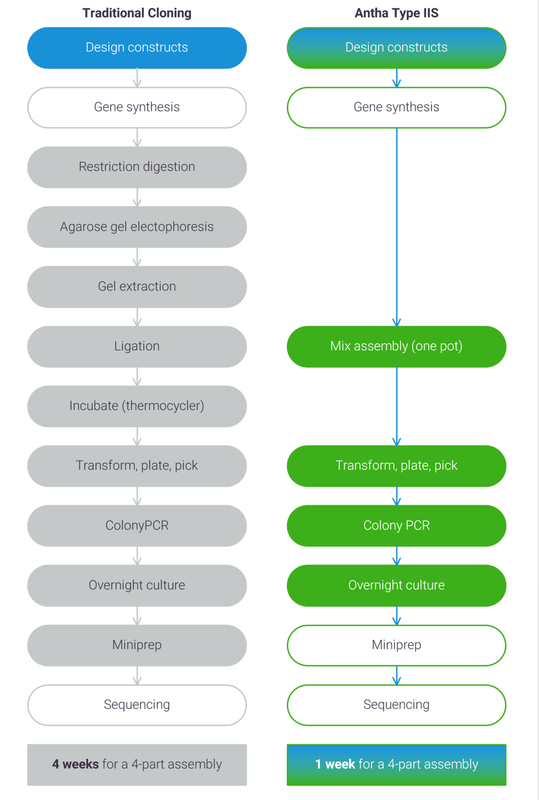 Further, the workflow automates the transformation, plating out, and setting up of the colony PCR. After you upload a simple biological design file specifying the parts and the conditions of the assembly reaction, Antha defines all the required pipetting steps to carry out the assemblies according to your design. These pipetting instructions are sent directly to liquid handling robots that carry out the assembly. Antha ensures that complex DNA assemblies are run exactly to specification. It frees you to think about what constructs you want to test, not how to make them. And automation reduces the amount of time at the bench, dramatically increasing the number of assemblies that can be performed robustly. DESIGN: The drag and drop user interface allows the researcher to rapidly compose complex workflows. EXECUTE: Common lab hardware comes pre loaded allowing for quick execution on liquid handling robots. 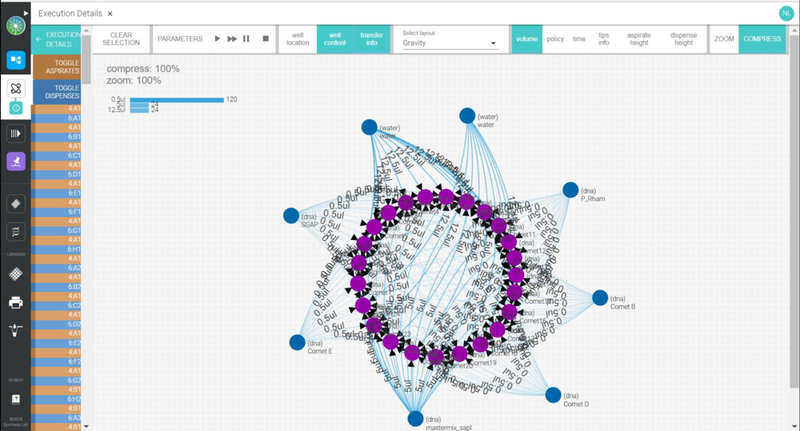 SIMULATE: Representation of all pipetting actions (blue lines) to make 24 assemblies (purple dots). ALIGN: Sequence data can also be aligned in the platform. The Antha Type IIS method assembles DNA parts directly from clonal vectors in a one-pot, room temperature reaction, making it ideal for full automation using simple liquid-handling robots. Antha Type IIS was developed by Synthace by applying Design of Experiments (DOE) principles to Golden Gate Assembly. This yielded a process that produces colonies 100% of the time for 5-part assemblies in which >95% of those colonies contain the correct construct. We have tested the optimised automated protocol under a range of conditions and found it can handle variations in environmental conditions and input materials. This robustness has been shown with up to 5-part assemblies and multiple Type IIS restriction enzymes. By conducting a DoE, a substantially simpler and more robust set of conditions were identified (Green box, experiment 2) compared to the previously used Golden Gate protocol (Experiment 1) . These conditions are now known as Antha Type IIS. In the diagrams below, the yellow bars represecent colonies containing the wrong construct. Our client, a leading multinational pharmaceutical company, sought to optimise their antibody construct assembly. Multiple heavy and light chain constructs were assembled combinatorially, using 3 or 4 components in each reaction with digitally controlled automation, resulting in an assembly success rate of 100%. They looked to incorporate our Computer-Aided Biology into their existing workflow. To do this, they simply uploaded the design file into Synthace's platform. The software seamlessly validated the assembly in silico and detailed the deck and plate layout necessary to set up the experiment. The Gilson PIPETMAX® subsequently undertook the liquid handling steps under the control of the software, saving hours of laborious and error-prone manual pipetting. The overall assembly time was reduced by a third compared to their conventional optimised cloning protocol. Because the process was automated and controlled digitally, the software made reproducing experiments and tracking sample provenance simple and automatic. Using Synthace's platform and the Gilson PIPETMAX® the antibody construct assembly experiment was designed, simulated, set up and run quickly and precisely. All reactions produced colonies, 97% of which contained the clonally correct construct. The three results for each construct are increasing plating volumes. This example illustrates a proof-of-concept case for how to integrate Computer Aided Biology into your DNA Assembly workflows. With applications rapidly coming online for advanced bio-processing solutions, construct assembly, assay development, and drivers for more types of lab hardware, the opportunities to transform your lab’s productivity are endless.